Our correspondent reluctantly returns to the trenches of the health care cost debate and reports back, with heart. I&apos;m somewhat embarrassed to report a second fearful trip through an emergency room in four months — this time for chest pains — and that I emerged with an even cleaner bill of health than the first time. I&apos;m beyond grateful to all the professionals who cared for me, and I&apos;d recommend them for all your emergency needs in a heartbeat. If I were the health care industry, though, I&apos;d also be embarrassed — about how much these efforts cost. As chronicled here previously, my first emergency room admission, in the dead of Minnesota winter last December, followed my collapse onto the carpet of a St. Paul theater lobby during intermission of a Christmastime musical show. After a mile-long, $1,400 ambulance ride to United Hospital, 12 hours of overnight monitoring for certain enzymes released into the blood during a heart attack, plus my first-ever echocardiogram the next day: zilch. Conclusion: dehydration-induced syncope. Total billed: $10,260. Still, it&apos;s easy to have doubts about one&apos;s coronary health. Cholesterol is only an indicator, mind you. Thus, the specter of a blocked artery entered my 51-year-old noggin one late afternoon in April at my parent&apos;s house in a wooded rural suburb about 30 miles west of Minneapolis. All day, off and on, I had felt a dull, pulsating pain just inches above my heart and palpitations. The record can conjure up paranoia. My maternal grandfather died of a heart attack at age 64; my paternal grandfather from heart and respiratory complications at 61. My dad underwent open heart surgery for a triple (or was it quadruple?) bypass at age 47; he was 76 when he succumbed from a web of cardiovascular issues. This past January, during a talk about genetics at the University of Miami, the dean of the medical school projected a photographic image showing the cross-section of a coronary artery that was entirely clogged with plaque. It belonged to 28-year-old Russian figure skating champion Sergei Grinkov, whose unremarkable cholesterol levels and otherwise clean bill of cardiovascular health belied the fatal heart attack he suffered in 1995 before he could celebrate his 29th birthday. Who hasn&apos;t heard the story of some superbly fit person, who felt really great one day and then dropped dead an hour later? So I went for a midday run, which was a little harder than usual, but not alarmingly so. And then afterward the dull, throbbing chest pains continued, again in that one spot. They worsened as the afternoon passed. The dull pain spread into my left shoulder and then my left hand was tingly and weirdly cool. I was eerily lightheaded and suddenly filled with a sense of doom. What the hell? The sun was low in the woods when my mom pulled her Passat into the garage, after a three-hour drive from Rochester. Having just turned 80, she had treated herself to a thorough several-day long examination at the Mayo Clinic. (Medicare and Blue Cross Blue Shield covered everything). She ordered a pizza for dinner. I grew more worried. The pizza arrived. We sat down at the dining table. I felt even stranger. After forcing down one slice, I couldn&apos;t hold my tongue. "I think I should go to an urgent care center," I said. It was now past 8 p.m. Was one even open? My mom made a call. After a 15-minute drive east towards Minneapolis, we arrived at a nice suburban clinic called WestHealth. Soon, a doctor and a nurse were concerned not only about the chest pains I was reporting but also about a little valley on my electrocardiogram indicating "early repolarization." That can mean the heart&apos;s electrical system is screwy. But it can also owe to physical conditioning, as I learned in December, if the heart belongs to someone who runs about 5 miles, four to six times a week (as does your correspondent). Incredibly, I heard the doctor say calmly, "I&apos;m not sure that you&apos;re not having a heart attack." He wanted me to go to a hospital emergency room. By ambulance. Since I&apos;d had my fill of paramedic-propelled stretcher rides, rapid intravenous tube insertions and oxygen mask placements that night in December, I opted to transfer by family car. To prove it, I signed a release one of the nurses handed me in the hall on my way out. My travel-weary mom, foreseeing a late-night wait outside an emergency room, opted to head home and enlisted my sister for the next leg of my journey, a 15-minute drive south to Park Nicollet Methodist Hospital. West Health had phoned ahead, alerting the head triage nurse of my imminent arrival. I checked in with a receptionist at a desk located in the waiting area, which was packed. She told me to take a seat. The pains above my heart continued, but were no longer worsening. A middle-aged woman lay on the floor, in the fetal position. Ten minutes passed. Recalling the doctor&apos;s words — I&apos;m not sure that you&apos;re not having a heart attack — I thought I&apos;d better reconfirm my presence, this time with the triage nurse, who was seated on the other side of a counter with a big window overlooking the waiting area. Yes, she was aware of my arrival. A few minutes later a nurse called me in. For the next hour a team of impressive nurses and medical technicians took my pulse and blood pressure, read my blood oxygen, drew several blood samples, X-rayed my chest, jammed an intravenous tube into my arm and affixed me with electrocardiogram wires. Then I told a doctor the whole story. He asked me to show him the spot from which my chest pain was emanating. He pressed two fingers into it. "That&apos;s good," he said. Because topical pain like that was almost certainly musculoskeletal, as opposed to myocardial. I brightened at the prospect of going home. But, no. Doc wanted me to stay overnight for more monitoring. My sister left. A nurse wheeled me down a hall to a cavernous room with three beds separated by curtains where I would try to sleep for a few hours. "The more diffuse chest discomfort into his left arm could conceivably be myocardial," he would soon write. "The patient is a good candidate for our chest pain evaluation unit, low risk." I was booked for an early morning stress echocardiogram. I&apos;d been putting off a cardiovascular stress test for years, in part because my hospitalization/emergency plan doesn&apos;t cover one, unless it occurs during an emergency hospitalization. An echocardiogram per se, like the one I had in December and during which the patient remains motionless, is not as effective as a stress echocardiogram in discerning, say, coronary artery blockage. That&apos;s because the stress echo is administered while the patient pedals a difficult exercise bike while laying on his back, frock open, until his heart rate is, say, more than 144 but less than 169 beats a minute. About 10 minutes later, as the patient continues to pedal furiously, a flirtatious technician presses her transducer (which resembles a small plastic microphone) into the nooks and crannies of the ribcage covering the patient&apos;s heart area for several minutes. Echocardiogram results are immediately available. Mine that morning indicated my heart had normal chamber size, wall motion and thickness, and appropriate hyperkinesis and ejection fraction increases. Conclusion: no evidence of inducible ischemia. In other words: no signs that any portion of my heart was freaking out, and, by extension, no evidence of coronary artery blockage. Still, I elicited a couple of disappointing facts from my stress-echo tech. You can&apos;t really know if you have a half-blocked artery. One could pass a stress-echo with flying colors but still have a coronary vessel that is 50 or 60 percent blocked, she said. That&apos;s because stress-echoes generally detect only the degree of arrhythmia, ischemia and other irregularities that a 75 percent or worse blockage can cause. If doctors really want to see the arterial blockages of a living human being they order an angiogram, a very costly, invasive procedure requiring general anesthesia and the insertion of an almost invisible catheter into a vessel, often in the groin, forearm or neck. The surgeon somehow guides it to the suspected area and deposits a radioactive dye that turns up in X-rays. Doctors (and insurance companies) tend to reserve angiograms for folks whose echocardiograms indicate a 75 percent blockage or more. In other words, you don&apos;t get an angiogram unless your cardiovascular system is ultra-messed up. Still, I was very happy about my results and for a moment, as I lay catching my breath, the euphoria displaced any thought of how much this crash course in coronary medicine was going to cost me. 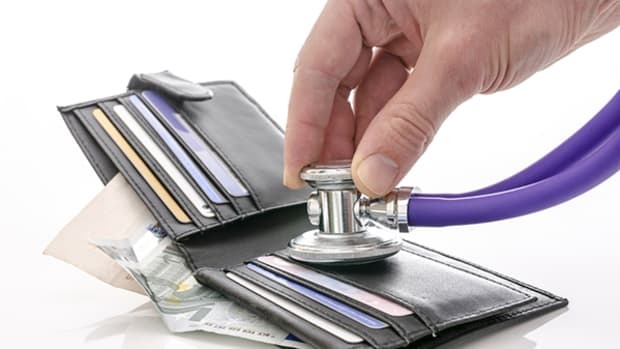 Self-underemployed me, I have the kind of policy that experts say is the wave of the future: premiums that nearly double in two years, high deductibles, and still you have to pay $450 out-of-pocket for an annual physical. A talkative guy from the Dominican Republic wheeled me to the elevator and down to my bed in the emergency facility. I put on my normal clothes, waited for the discharge doctor and chatted with my nurse, a friendly immigrant from Poland. "Do you know how many people come in with exactly the same symptoms you had and the doctors find nothing?" she said. "A lot." I felt less dumb. Similarly, after receiving about $2,580 from BCBS and $200 from me this past winter, United Hospital in St. Paul recently waived the balance of my after-insurance bills, under its financial aid program. However, a BCBS appeals coordinator has reaffirmed the exclusion of my mile-long, $1,400 ambulance ride last December from its emergency/hospitalization coverage. Meanwhile, I promise to avoid all chest pains, hospitalizations and ischemia, and to not join the unlucky millions who&apos;d have to produce $14,972 for two emergency room visits all by themselves. Kirk Nielsen is an independent journalist and writer based in Miami. Over the past decade, he spent much of his time chronicling activities of major spies, terrorists, politicians, and other demagogues embroiled in U.S.-Cuba relations. Kirk Nielsen takes the pulse of the nation's emergency health care costs by passing out and getting gouged.